I don’t understand why anyone would pay $100 for shoes that have this much excessive cushioning. These are not only ugly, but a gimmick and also not good for the majority of people who wear them. As many shoes companies are making running shoes with less cushioning for a feeling of not wearing shoes period, Skechers is piling it on as an illusion that more is necessary, and that’s become a myth in the last couple of years. And then you have old athletes like Joe Montana and Karl Malone endorsing these. Yikes! 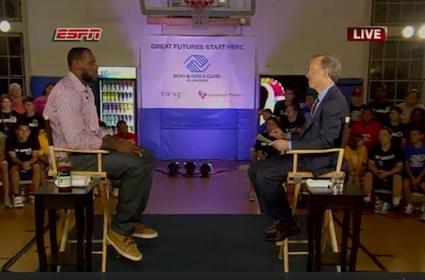 How desperate for a check are you when you have to endorse overpriced, over-the-top sneakers? Say it ain’t so, Joe! Having worked in the grocery industry for four and half years, one thing I’ve hated about it is the club cards. Why do they even exist? So stores can track what you buy? Please. That’s called espionage and what I buy is none of your business. When I worked for one company and it was bought by another one, one of the first things that disappeared was the club cards and we were happy. No more having to ask if they have it or for their phone number or any of that funny business. Not to mention everyone has a card now. I say we get rid of these cards and we do so in 2011! I think you mean Shoes That Don’t Look Good. I understand why people buy these shoes, it’s because some of the profits go to children in poor countries who don’t have shoes, and that’s great and I have no problem with that whatsoever. But couldn’t you make some better looking shoes? These are very, very ugly. Some look like shoes ninjas wear and some look like they were designed by kindergarteners and blind children. 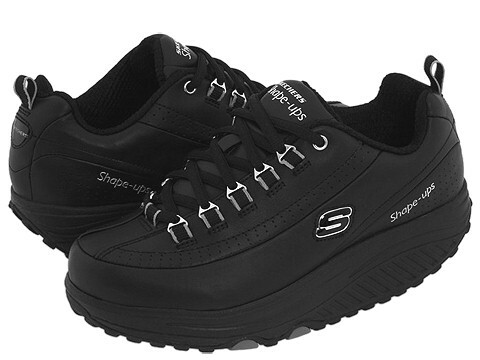 These are the Honda Element of footwear. This may be what passes for ideal footwear in Sudan, but in this country, some of us have a little something called taste. We have cool shoes like Converse All-Stars and Vans. Why would anyone want to trade those in for these ugly things? I think the only reason people buy them is because they feel bad if they don’t because they wouldn’t be helping the kids without shoes. I say bypass ever buying a pair of these and write a check, once you’ve sent the check and it clears, go get some low top Converse All-Stars and be apart of the cool crowd. This really bothers me and I will tell you why. It screams laziness and tells people “I don’t care anymore about my appearance, about doing what I should be doing, or about anything”. I am so tired of seeing people at ARC who have morning classes going to class in pajamas. These people are obviously lethargic and probably don’t shower before school. 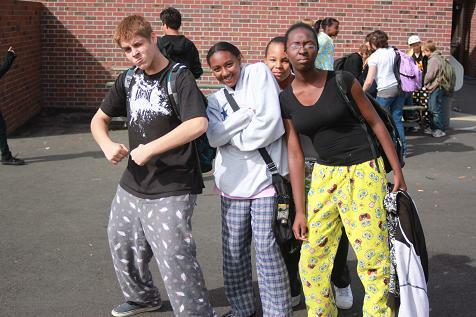 And I think Pajama Day at the grade school level should be eliminated. I have never worn pajamas to school or at my job or even in public save for the emergency late night run to the store to get some milk or whatever. That’s acceptable. Other than that, get dressed, and also, put some shoes on. Your house shoes or slippers are not acceptable footwear to be in public with, you jerks. No wonder I’m obsessed with people who dress nice (especially when girls look hot at school… YES!) , it’s because there are quite a few people who don’t even care. Put some effort into your appearance for criminy sakes! I know, I know. I’ve bagged on this show quite a bit on this blog, but there is a growing hatred for this program that I’ve encountered since its premiere. The main thing they say is how bad the singing is, and they’re right, the singing is pretty bad. Not to mention the only reason this show exists is because the High School Musical film series has concluded, so everyone who liked that and these people by the way (most of them) were popular in high school and because they were, they relate to this show and High School Musical very well. I was the guy people threw garbage at in high school, so I can’t relate to it at all. I want to forget high school ever happened. 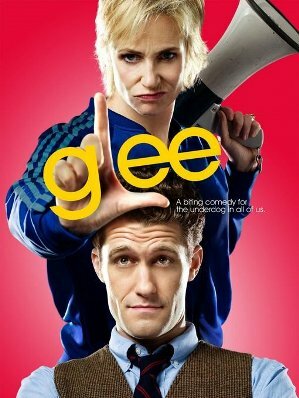 Some also want to relive it via this show. Also, I’m a guy. Guys don’t generally watch shows as feminine as this. We find the game or something of quality. This show was better when it premiered in 1982 when it was called Fame and had the great Nia Peeples on it. If she was younger and she knocked on the door late at night saying she was lonely, she would come in. YES! I have hated this product from the beginning. This thing screams Heaven’s Gate to me and is just a robe you wear backwards. I cannot see how people could use these in private or even worse, in public. I would never use this thing and I live in a house that’s always a toasty 40° inside. That commercial had to have been filmed in Utah,it’s so white! This has really bothered me for as long as I can remember. Every time I see a dog or cat with a sweater on them, I can’t help but feel sorry for the animal because their owner has humiliated them. Why do animals need sweaters or hats or any clothes? They already have that, it’s called fur. Last Christmas, my siblings put a Santa hat on my cat, Ozzy, and I was livid. I wouldn’t open any presents or anything until it was off his head. Poor kitty. 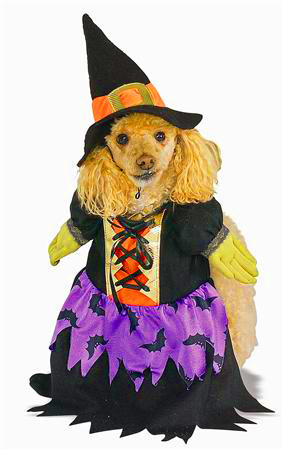 Even now when I go Halloween costume shopping, I see a section devoted to Halloween costumes for pets. Really? Costumes for pets? Costumes for creatures that can’t even eat candy? Seriously? Wow! I seriously cannot believe that people think stuff like the picture to the left is cute or entertaining,it’s not. Stop humiliating your pets! 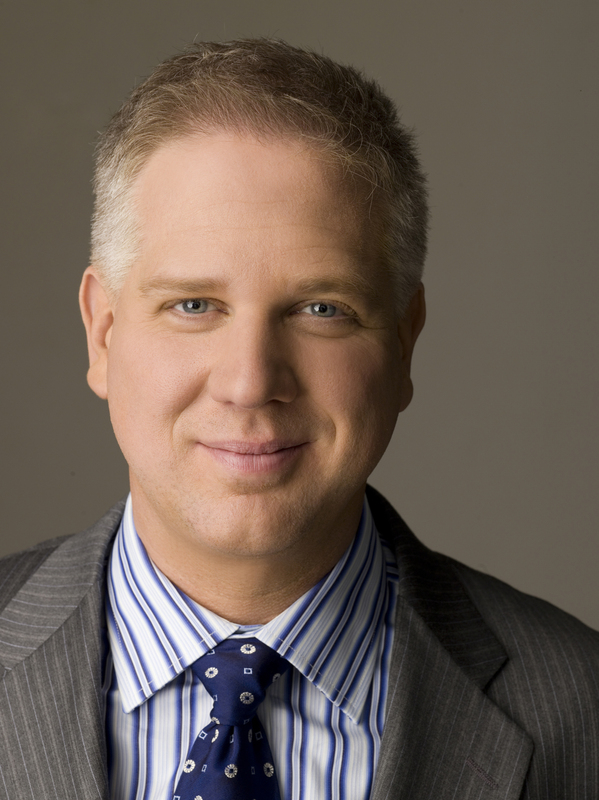 I can’t stand this guy; Beck is a guy who is pretty looney in my opinion. I absolutely don’t agree with a lot of what this guy has to say and I don’t like his mannerisms or that shtick of wearing his eyeglasses halfway down his nose. It kind of reminds me of a teacher you had who wanted to see you after class. Also, that lame excuse of him not knowing that his rally was the same day of the anniversary of Martin Luther King Jr’s “I Have a Dream” speech. What a load of crap! If he was the historian he claims to be on his show, he of course would have known that and I am sure he did. It’s pretty sad when a former wacky morning radio disc jockey that once had listeners insert hamsters into those ATM tubes to make deposits as a prank is the lead dog on the worst and biased news channel in this country. OH,and Glenn, stop wearing sneakers with your suits, David Letterman circa 1988 called and he wants his shtick back! Fox Noise: We Decide, We Tell You What to Believe, So Shut Up! I am sick of seeing white people doing this. 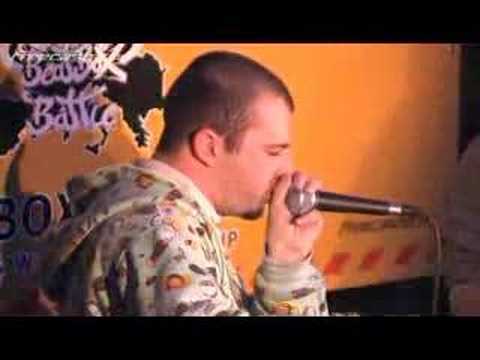 Beatboxing does not make you look cool, it makes you look whiter than you already are, not to mention that white people who aren’t named Eminem have a history of not being decent rappers which by default means they can’t beatbox. Not even white people with soul like myself can pull it off. If I can’t do it, what makes you think you can? That’s what I thought! 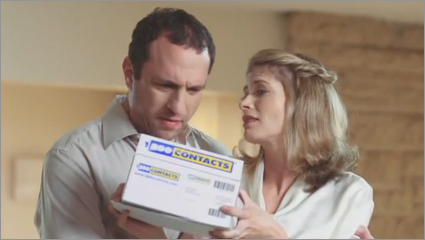 I have to say these commercials for 1-800 Contacts are just awful. The way they try and portray soap operas and how they have special eyes because they wear a certain contact lens. What a load of crap! Your eyes are no special than mine. Whether you wear contacts or not, you have to agree these commercials are just campy and need to go away. As far as people who wear glasses in ads for contacts like Acuvue, I really hate how they’re portrayed. They’re portrayed as weak, shy, and ugly to society. It’s fine if people want to wear contacts, but having to wear glasses isn’t the end of the world, either. I think it’s just another way for the media to make vanity be everything. It isn’t. Who you are inside is and will always be what matters. I wish the people at Acuvue would realize that and should find a way to incorporate that into the advertising their product. I’d like the Oregon Ducks a lot more if they didn’t change their uniform every week. 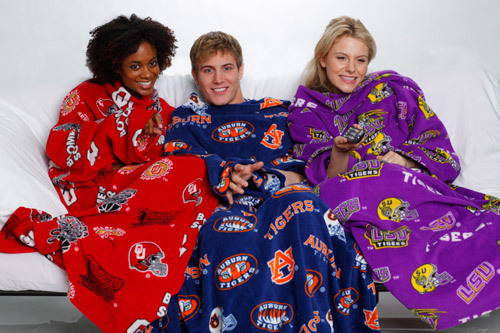 In sports, you only need two uniforms, one home and one away and the occasional alternate if you so choose. 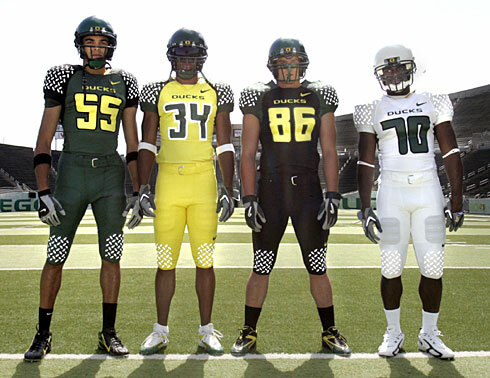 Oregon has too many uniform options, and they also have the most obnoxious shade of yellow used on them. And I’m sick of UO fans defending the look and also having the same bad taste. Not to mention that they’re hideous and I hate those stupid wings on the shoulders. The players are not actual ducks! Legendary college football programs like Penn State, Ohio State, LSU, Michigan, and others have only two uniforms. Why? Because that is all you need. Until Oregon straightens out its football identity crisis, I will pick their opponent in every game and every bowl game they play. Sorry, but ugly uniforms have consequences. Go Tigers! 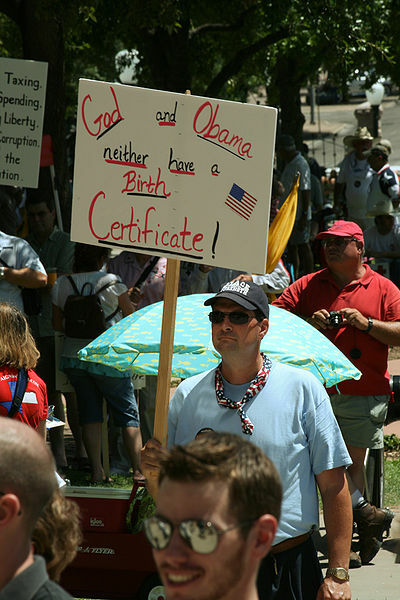 I am so tired of this group of people who insist that President Obama wasn’t born in the United States, even though he was and that evidence of this has been presented on multiple occasions. I think these people are not only bored with themselves and cling on to something that’s untrue hoping that it will be one day, but it’s also just sour grapes by them because he won the election. I understand if you don’t like the President, trust me, I hated the last guy and still do, but going as far to question whether or not he was born here is simply outrageous. I encourage all of these people to just stop it, go find a hobby, and to go do something because I am sick of hearing from you. I know we’ve only had one, but I fear that this may be a trend not just in basketball, but in every sport for years to come. When LeBron James did this, I had to wonder why. I mean, can’t you just call a press conference? Isn’t that enough? I think so. Even that may be too much, just ask Kevin Durant, who made no visual public announcement when it came to him re-signing with the Thunder. Now make no mistake, it wasn’t LeBron’s choice to go to Miami that I was upset with (although I was hoping he would stay), it was the way it was done via this hokey one-hour special announcing it and also letting an entire state down who cheered you for seven seasons and not even acknowledging them and thanking them for their support of you all these years as if it meant nothing. I also didn’t like that welcome rally that you, Dwyane Wade, and Chris Bosh had the following day, coming up on scissor steps. I also think this hurts the NBA. Now all these players are going to want to team up with each other instead of competing against each other, which in turn dilutes the talent pool and squeezes small market teams like my Sacramento Kings out of a chance to have a competitive team. I better not see another Decision-type special again next year, and since there was a lot of backlash from LeBron’s, I don’t think we will. This trend has gone on too long, kids. 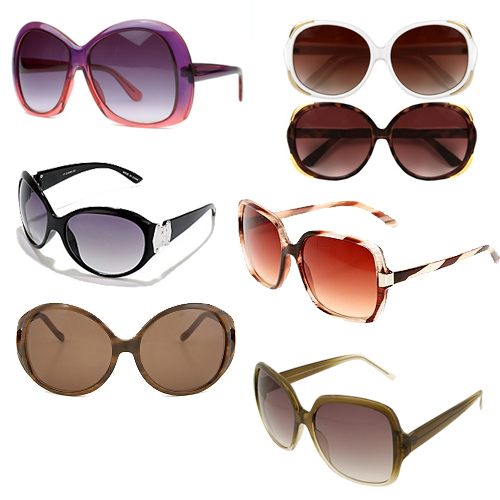 I am so tired of seeing big sunglasses on people (mainly girls), the reason being that when I see a girl with sunglasses covering 80-percent of their face, it does nothing for me and detracts from their appearance. In addition, the trend is slowly but surely been creeping into the styles of eyeglasses, although the trend isn’t catching on quite yet, I fear that it will and that when people like me go to get new glasses when the time comes, big eyeglasses are all I will have to choose from, and the thought of that scares me. Big eyeglasses were happenin’ in the 1990s, which by the way were a bland decade for eyeglasses, looking back, you wonder why they ever were cool and I have to just shake my head that they are starting to come back now during what I think has been a great time for eyeglass styles the last decade or so. I have been hoping this trend goes away for years now. Why would anyone want big eyewear on their face? I don’t. As far as this goes, less is more. 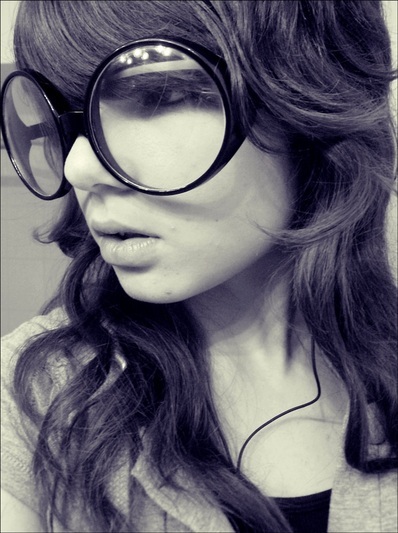 I hope that in 2011 that these oversized shades and frames reach the end of the trend. This was originally going to be left off of the list, but with Bristol Palin being a non-celebrity on a dance show designed for people who were celebrities and nearly winning it to her other daughter using homophobic slurs on Facebook and drugs (allegedly) to her mom’s crappy reality show, this family did nothing but annoy me in 2010 and I’d love nothing more than to see these people go away in 2011. 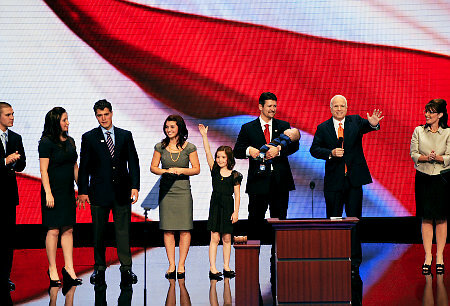 They are just one of the most unlikable famous families I’ve ever seen. It probably won’t happen because Caribou Barbie is probably going to run for President in 2012 and will lose if she does so because many people do not like her. That’s it,that’s the list! Let me know what you think!